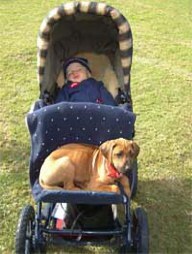 We sometimes have puppies available and all buyers are screened very carefully as to their suitability. Puppies sold as pets are available at 8 - 9 weeks of age, but show puppies do not leave for their new homes until they are 11 - 12 weeks of age. This gives us extra time to fully assess the quality of the puppy and only top quality puppies are available to show homes. We believe that show quality puppies must have much more than a good ridge! All puppies are wormed every two weeks from birth. I am always available to the new puppy owner for ongoing support and advice. Living in the country, we have the luxury of having large, spacious runs and our puppies are always fit and healthy when they go to their new homes. If, for any reason, the puppy is ever in need of a new home, I am always available to take it back and look for a suitable new home. I consider that to be one of my responsibilities as a breeder.